A week ago, I posted two similar photos of a windmill and hay bales in the Nebraska Sandhills. I asked for help deciding which was a better shot. In case you’re curious as to results and don’t want to sort through all the comments to see which photo was more popular, I thought I’d post the answer here. Thanks for your help – have a great weekend. Windmill and hay bales. Nebraska Sandhills in Cherry County. 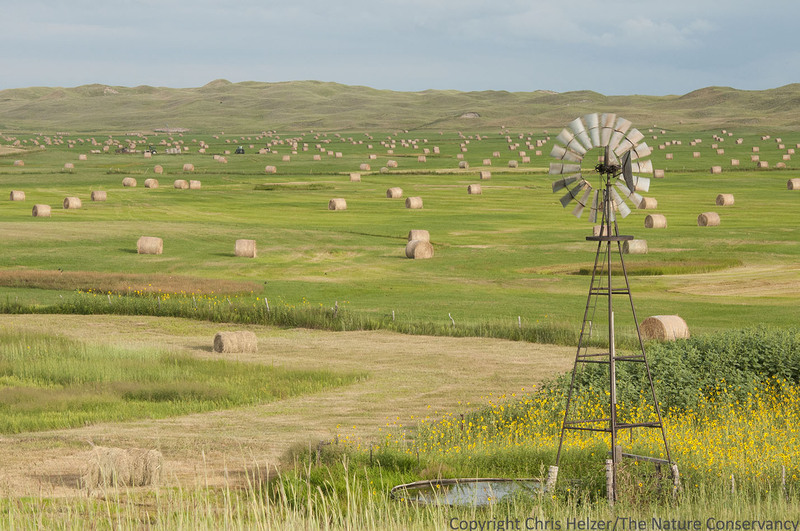 This entry was posted in Prairie Photography and tagged hay bales, landscape, nebraska, prairie, sandhills, windmill by Chris Helzer. Bookmark the permalink. Ahh, you tricked us. Your new photo post is perfect!!! I like this one as it blends both the hay and the windmill into one photo.